A sore loser always talks trash after he/she faces utter defeat. Rosa Rubicondior is no different. 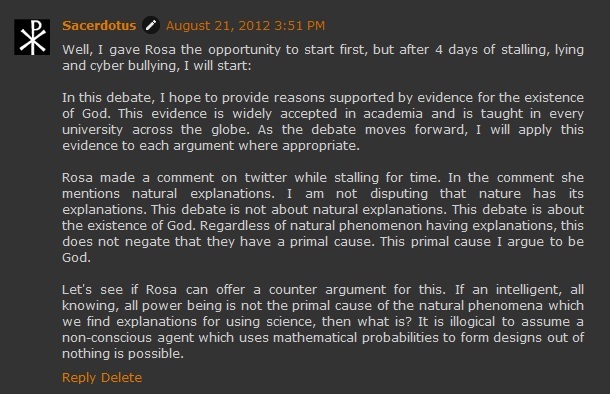 After being defeated in a debate, Rosa began posting all kinds of things that bring to light her obvious poor mental state. She is in denial and is projecting her behavior on me by claiming that I refused to debate her when I flooded twitter with my request that she follow through with the debate and not bow out. She instead replied with ad homem and stalled until she forfeited and was declared the loser. ***Debate: Is There Scientific Evidence Only For The Christian God? This is a stall tactic. My rules were clear about providing evidence alongside coherent reasoning. There is no such thing as the "Christian God." God is God. God does not belong to any religion or any one. The God of Christians is the God of Muslims, Jews, Atheists, Hindus, Skeptics, Pagan, Buddhists etc etc etc. Again, I specified the debate was solely between you and I. This was nothing new. A referee for what? You chose a non-denominational Lesbian minister who I debated with in the past and who blocked me just like you do when I'm winning. How is that fair? This is just a stall tactic. Moreover, the debate was my idea and I had set the conditions already. 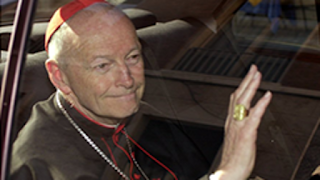 You cannot impose your will on a debate that you did not initiate. Had you invited me to your blog, then yes you have every right; however, I invited you and therefore you must respect the rules and conditions that I established or just refuse to debate like Dawkins refused to debate Craig. The latter would not have been as embarrassing as the stunt you pulled off with all the lying and stalling. <<Whether an assertion of fact has been validated with verified evidence. Whether questions have been answered fully, honestly and without prevarication. 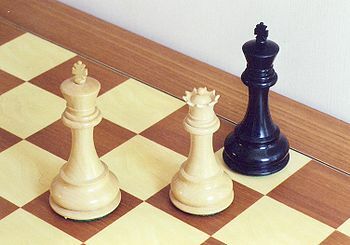 The meaning of words, when these are in dispute. Whether an argument was ad hominem or not. Any other disputes when requested by either of the parties to the debate. Whether a referral to the referee was mendacious or an attempt to prevaricate, divert or otherwise obstruct the normal flow of debate. Common sense dictates that this referee would have to be an expert on the respective fields from which the evidence derives from. ie, if I use physics, he/she must know what I am talking about. No one can learn physics overnight. The rest of these that you list could have been done by us without any other party. You and I are adults. My rules touched on your criteria already. Again, you were stalling. This demand is a bit extreme because you would have lost by default. Your position rests upon proving a negative. 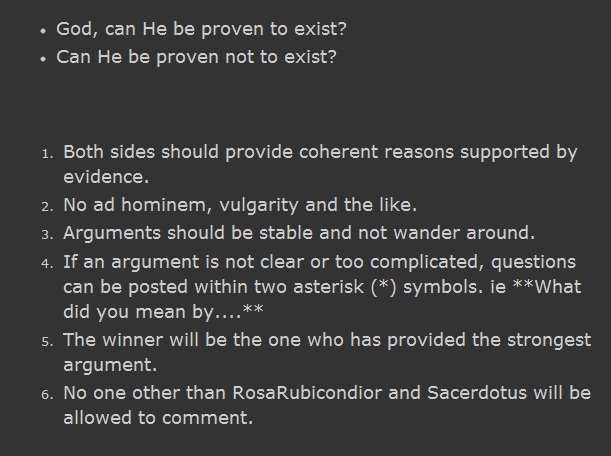 How can you provide evidence for the non-existence of something or someone? Rosa, you would have forfeited immediately. 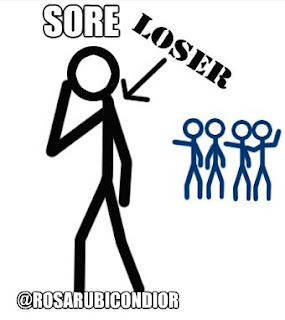 All you do is post ad hominem arguments. On Twitter you had a ad hominem free-for-all. Your tweets were ridiculous and made you look foolish. I think a lot of people lost respect for you. This is your doing, not mine. I reply immediately unlike you who never does. I gave you the opportunity to start with your opening statement first and you beat around the bush. Your own friends then told me to start first and I did. I posted my opening statement and we all waited for you and again you stalled until you forfeited. You disappointed your Atheist friends. I initiated the debate and was clear that it would take place on my blog. It is wrong of you to make demands if you were not the originator of the proposition to debate. Bouncing from blog to blog would have made it confusing for us and our readers. There were no terms to accept because you agreed to MY debate. I sent you the link which had all the rules and conditions. You cannot impose your rules on a debate you did not originally propose. You are wondering now what evidence was going to be presented and that is your fault. Had you had the confidence in your Atheistic reasoning to continue with the debate, you would have been in awe of the evidence presented. 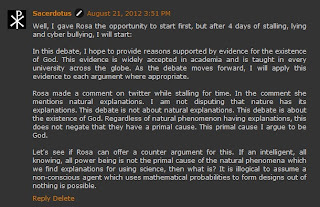 You are dealing with a science guy here, not the fundamentalists you bash on your blog. This was why you backed away. You knew I would take you on heavily and destroy your poor reasoning. You cannot begin a debate with a proposition. You need an opening statement. 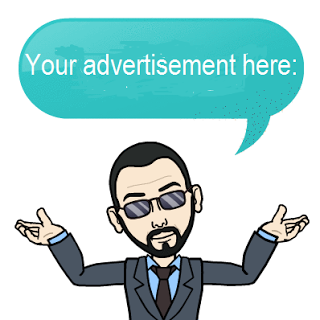 How can the audience know your premise and how you will defend it? There was no panic or denial on my side and everyone saw this. I sent tweets to remind you and everyone that your response was expected. You kept stalling and I had to remind you that you needed to be professional and continue with the debate. Instead you went on twitter and began posting nonsensical tweets and inviting your Atheist friends to attack me - another stalling tactic. One of them even said that you were busy with family. I question this because you had time to tweet, but not for an opening statement; therefore, you were not busy with family. You contradicted yourself. You say I sent 20-30 tweets and now say I had no intention of debating. You even posted a screen shot of my activity during the debate! How foolish can you be to say I was not interested in debating when those 20-30 tweets were reminders to you to post your opening statement so we could continue. Are you ok in the head Rose? This is not normal behavior. There was no need to worry about the debate being neutral or not. Your choice as referee is questionable. You chose a non-denominational Lesbian minister who I debated with in the past. Who do you think she would side with? You wanted to create your own playing field but failed and backed out because you were afraid to debate me. Anyone who has the intellectual confidence to debate would do so with anyone, in any place and in any time. A man can sleep on a bed or floor; only a prissy man requests his comforts. Your accusations of prevarication are based on prejudice. You assume what is not true and that is unfortunate. A debate does not exist to please the debater, nor is it a venue to give comfort to either side. What you asked for is like Obama requesting his teleprompter for his debates with Romney. You cannot script your own debate Rosa. Therein lies your phobia and your utter defeat. If you are prepared to defend your premise, then there would be no need of any third party. Your own arguments would hold their own weight. Obviously, you were not confident in your reasoning and needed a safe environment to debate me. I don't understand what you are paranoid about. You are correct. 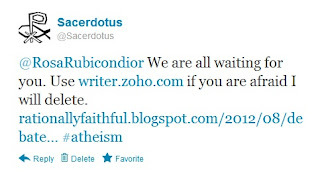 A vocal Atheist blogger stalling during a debate is not a pretty sight. 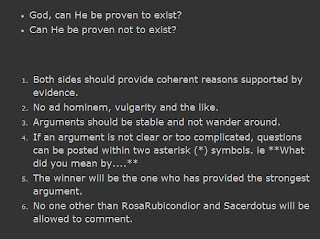 On your blog you present yourself as a rational person who is intellectually superior to religious people. However, on my blog, you became a weak pusillanimous uneducated individual who does not have the intellectual confidence to even present a premise and defend it. Your actions have seriously damaged your reputation. This makes no sense. Why would I provide an opening statement if I was not going to defend it? You are projecting your behavior on me. You never posted an opening statement at all. The audience was left wondering what you would be arguing for and how you would provide evidence for that argument. Instead you posted ad hominem. You exposed yourself as fraud and troll. I have the screen shots, tweets saved and they are memorialized on my blogs and a video. Rosa your denial is so evident in your post. While I started a blog, posted my opening statement, you attacked me, stalled and yet I'm the one who has abandoned my intellectual integrity? Are you not aware that the world can see your tweets? Are you not aware that many have retweeted them and they will forever circulate the globe despite you deleting them? 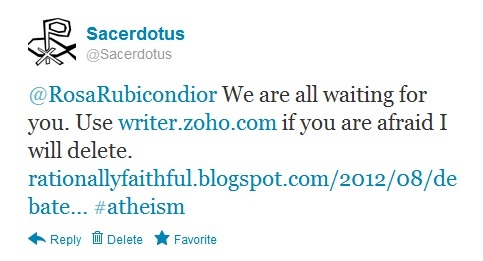 Are you not aware that I took screen captures of them and made a video of your failure to defend Atheism? You destroyed Atheism without even arguing for it. I thank you for exposing the stupidity that Atheism espouses. You have converted many to God with your nonsense. And you're a liar who censors comments. Try again, silly delusion freak. How so? Every thing is documented. If you fail to see this then you are delusional. You are an appalling liar. Everything is documented. Spare us the nonsensical comments. Someone should get out of the sandbox and stop playing and go take a nap now. 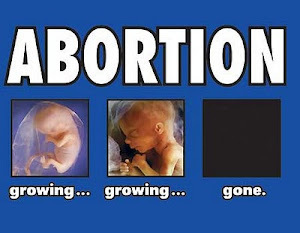 (Just an observation).